Time to make some homemade tortellini. Making pasta by yourself is quite a fun project and it’s not as hard as you might think. 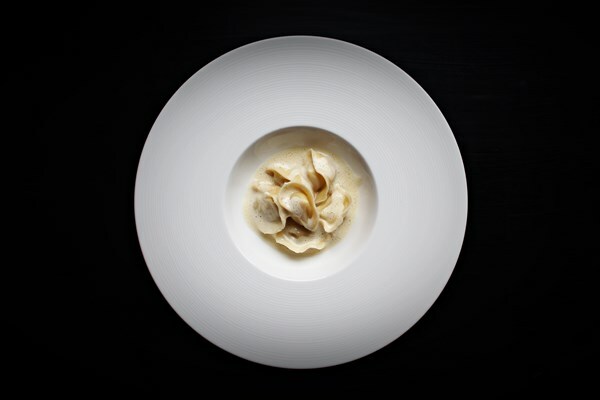 Try our recipe for Tortellini with Jerusalem Artichoke and Black truffle filling. It’s been a long time since I made any pasta from scratch at home but last weekend I finally got around to making some. 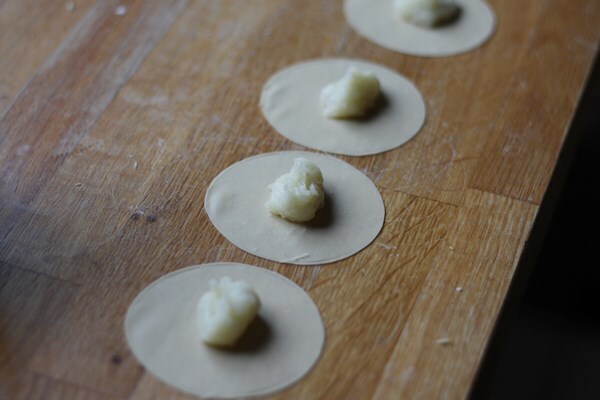 Whenever I make homemade pasta the result is always some sort of ravioli or filled pasta. Just making homemade spaghetti is not as rewarding. I actually did two different dishes, one pumpkin ravioli with sage and butter and then this one, Tortellini with Jerusalem Artichoke and Black Truffle filling. If you haven’t heard of Jerusalem Artichoke’s that might be because this lovely root vegetable also goes under the names Sunchoke, Sunroot and Earth Apple. I will however call them Jerusalem artichokes in this recipe. Also if you have never made pasta at home before then don’t invite people over the first time. It could be a bit tricky and it feels a lot better to have tried it at least once before. To make this recipe all you need that is out of the ordinary is a pasta machine. I have an old one i bought very cheap at IKEA. Unfortunately I don’t think they sell them anymore but check at your local store for kitchen equipment. 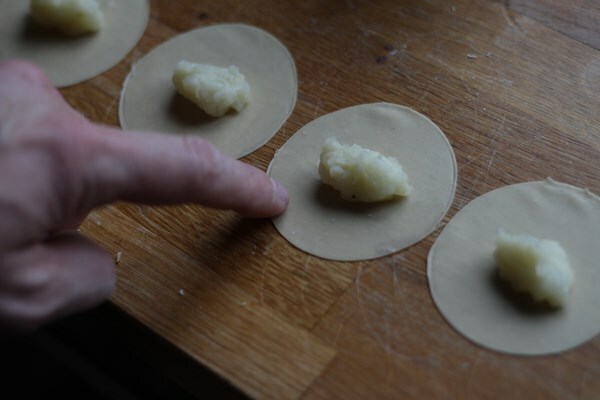 For cutting the pasta for the tortellini you can also use a round cookie cutter. I didn’t have one that was the right size so instead I used a small glass turned upside down and cut around it with a knife. This works fine too but takes more time. Some people use Durum wheat but I prefer regular wheat flour. 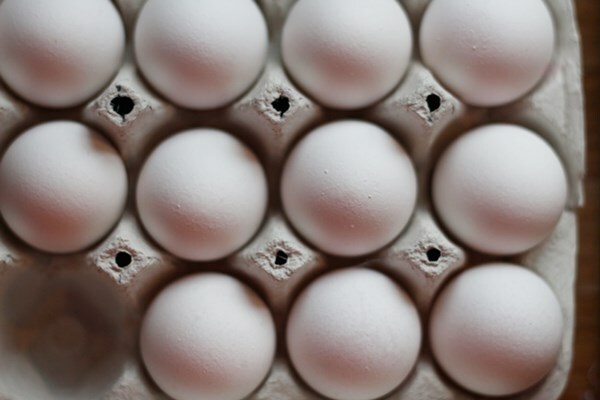 Put the wheat in a bowl and add the eggs, olive oil and salt and combine. 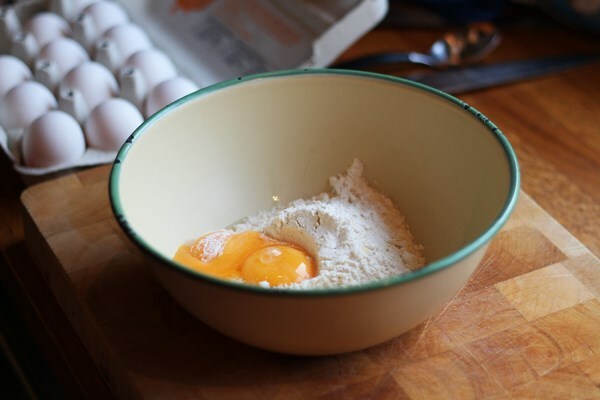 Knead in the bowl until you have a firm dough. Then transfer it to a counter and knead the dough for a good ten minutes or so. You want the dough to feel slightly elastic, but still firm and a bit shiny. 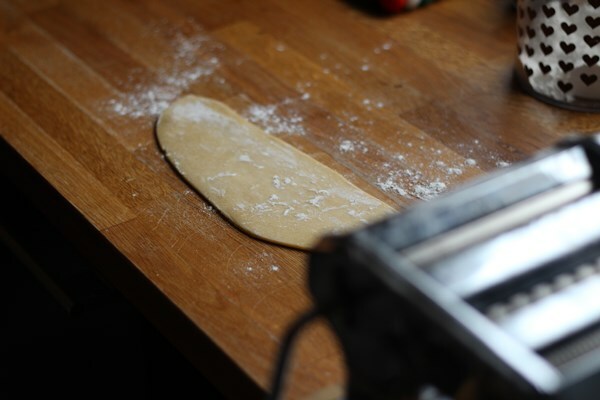 In many pasta recipes you are instructed to make the dough entirely on a counter. I think this only makes a bigger mess. The result is the same so make it the way you prefer yourself. Once the dough is done wrap it in plastic film and set in the fridge to rest. 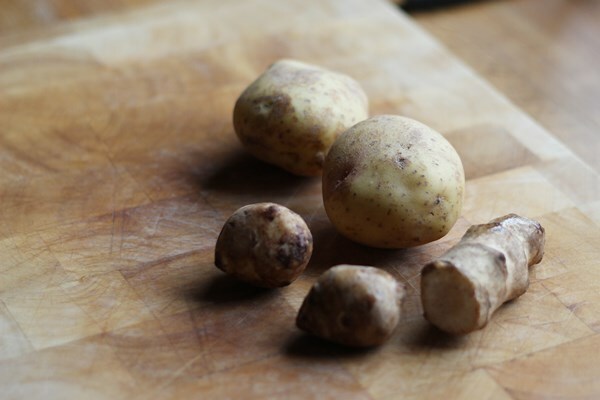 I use a combination of potatoes and Jerusalem artichokes for my filling. The potatoes helps with the texture of the filling. The starch will make this into a firm potato mash. Peel the potatoes and Jerusalem artichokes and boil in salted water. Once done discard the water. Add the olive oil and whisk into a rough mash. Check the taste and add salt, pepper and black truffle paste. I haven’t written any measurements for the truffles since these products can have a very different intensity depending on what type of truffles you can find. 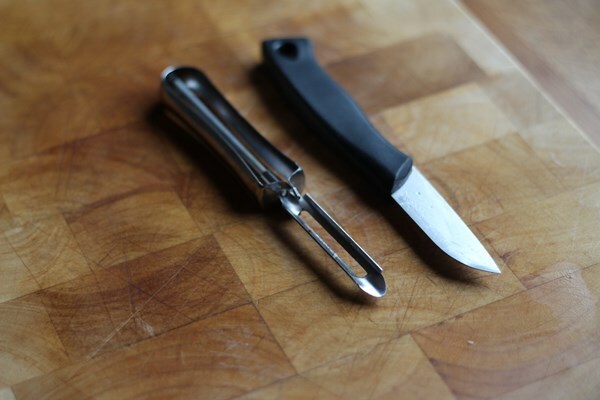 It is also fine to replace it with fresh truffles or truffle oil if that is what you can find. 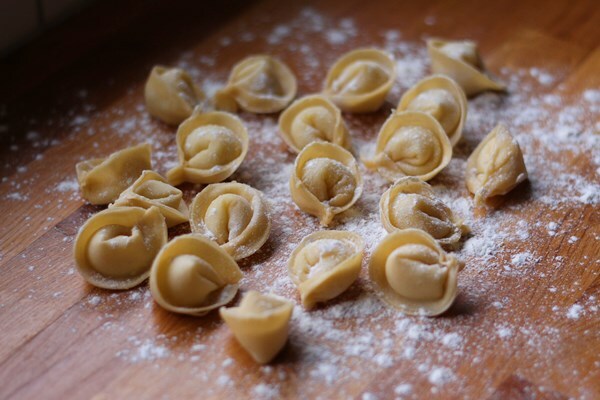 A super simple sauce for this tortellini. Peel and dice the shallot. Heat the oil in a pan and add the shallot. Let it cook on medium heat for a few minutes, season with salt and pepper. Add the white wine and bring to a boil. Let the wine reduce until a bit less then half is left. Add the cream and simmer on medium heat for about ten minutes. Strain the sauce through a sieve to remove the shallot. Check the taste of the sauce and add salt and pepper if necessary. Start rolling out the pasta dough. Start at the thickest setting and let the dough go through once or twice before making it thinner, for every roll through sprinkle the dough with some flour so it won’t stick on the rollers. My pasta roller goes from 1 as the thickest setting to 9 as the thinnest. The tortellinis was rolled at setting 8 on my machine. After you rolled it a few times the dough will probably be quite long. Then cut it in half and make one at the time. When you get to the thinner settings only roll out one piece of dough at the time, set the other pieces aside. If you roll everything out at once it will dry up and crack once you make the tortellini. Once you have a piece of dough ready cut out circles. My round shape is about 5 cm / 2 inches in diameter. Add a teaspoon of filling in the middle of each circle. Then dip you finger in some cold water and “brush” the edge of the circle with it. You can use a brush for this but personally I prefer to use my hands. You have of course washed them before. 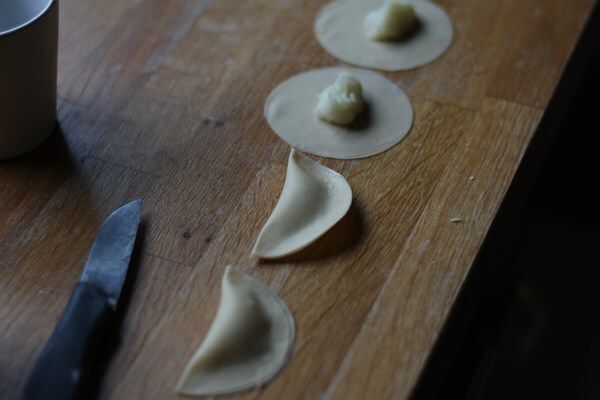 Then fold the tortellini in half into a half moon shape, then fold it again so the edges meet and squeeze them together. Unfortunately I didn’t get any good photos of this fold so if you don’t get a hang of it immediately just keep trying, it is easier than it looks. Once a set of tortellini is done set the aside and dust with flour. 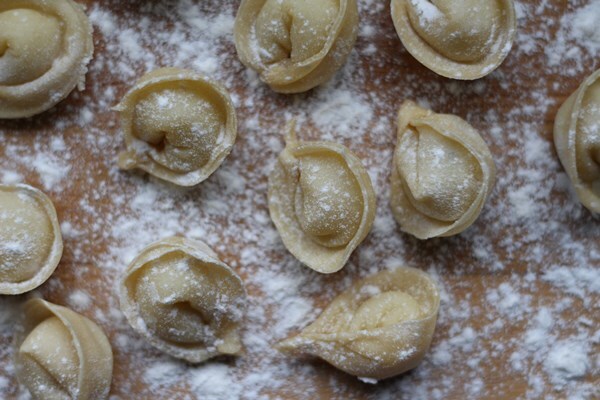 All you need to do now is to boil the tortellinis and serve them with the sauce. Bring a big pot with salted water to a boil. Carefully add the tortellinis and let them simmer in the water. Once the rise to the top they are done. 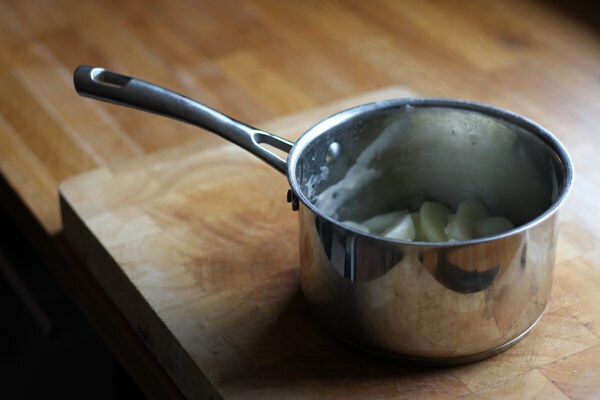 Some might stick to the bottom of the pot so you can nudge them with a spoon if they don’t float after a short while. 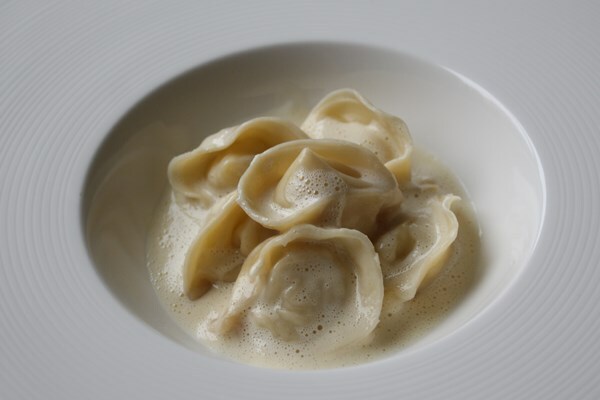 Let the tortellinis drip of on a plate. Bring the cream sauce to a boil and then mix using a handheld mixer. Add the tortellinis to the plates and then pour over the sauce. Serve. 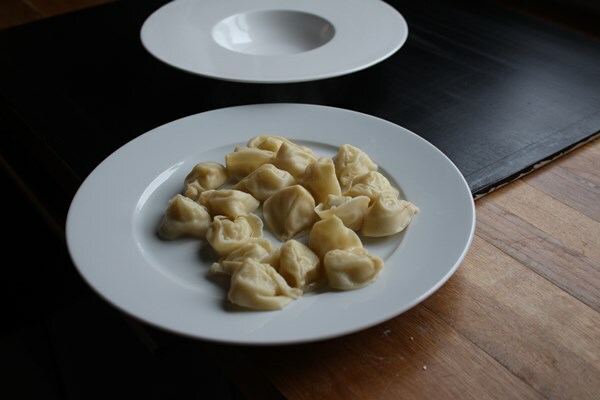 When serving tortellini like this, a small appetizer I like to use a small deep plate. The one on these photos is from the IKEA Stockholm series. Also I use no other garnish like cheese or herbs or anything like that. 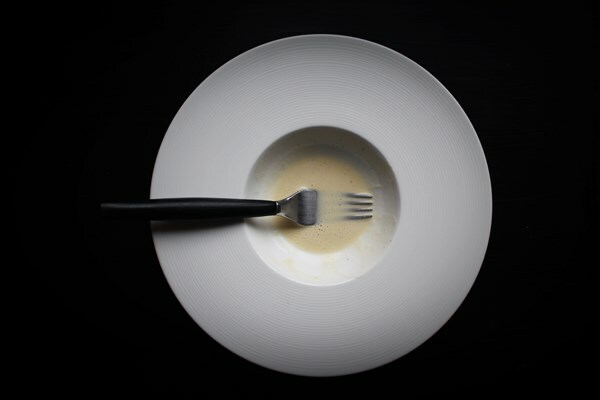 This makes this a very monochromatic dish which I really like, at least sometimes. Sometimes less really is more.